Product description: Dark & delicious, America’s great milk stout will change your perception about what a stout can be. Pouring hard out of the bottle, Milk Stout Nitro cascades beautifully, building a tight, thick head like hard whipped cream. Milk Stout Nitro is also good to go from the can with widget inside technology, or like a pro in a glass. The aroma is of brown sugar and vanilla cream, with hints of roasted coffee. The pillowy head coats your upper lip and its creaminess entices your palate. Initial roasty, mocha flavors rise up, with slight hop & roast bitterness in the finish. The rest is pure bliss of milk chocolate fullness. 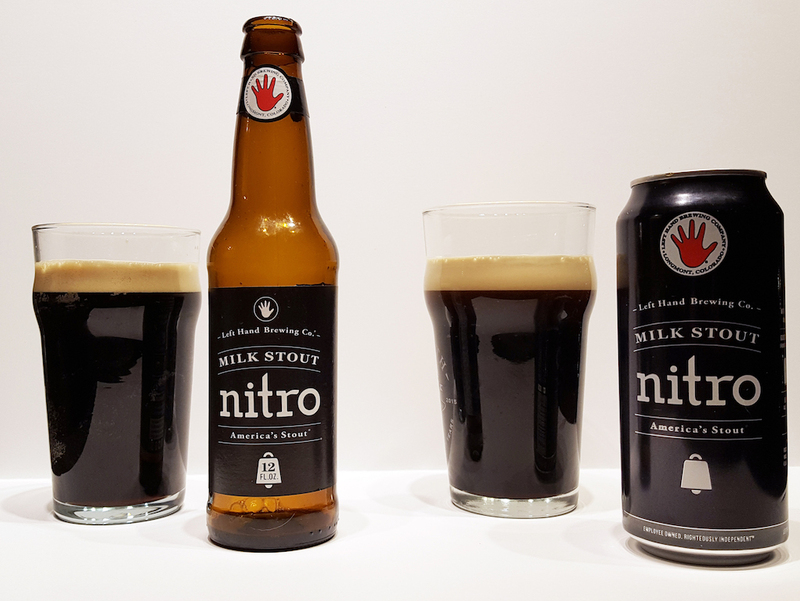 A side By side tasting of Left Hand Brewing’s Milk Stout Nitro from 12 oz. bottle and 16 oz. can – 6% abv. Left Hand Milk Stout is a tried and true recipe and the brewery’s most recognizable brand in my opinion. I’ve been long overdue to revisit this beer, which now has multiple versions to choose from: regular in 12 oz bottle, regular in 12 oz can, nitro version in 12 oz bottle, and nitro version in 16 oz can. Today we’re going to do a side by side comparison of the latter two. I’ve not actually tried the nitro version of this beer, so this will be a new experience for me. Not too many craft breweries even sell bottled/canned nitrogenated products. Modern Times has been doing it recently, but I haven’t ever achieved that real Guinness type of nitro looking cream head from their beers. A quick google search shows that this beer is really the only game in town. Versus Left Hand’s regular milk stout, I love the minimalist design on the nitro products. It works especially well with the can – standing out on a crowded shelf space. Sampling the bottle first (best by 02/05/2018), the cap says to “pour hard,” but I didn’t read that in time. If you pour this normally like I did, you get relatively weak foam, which sort of defeats the purpose of the nitro. Halfway through I poured from a higher height and you finally get some creamy tan foam to form. But there’s no reverse cascade effect like you see from Guinness products. Still, you get a nice layer of creamy foam that persists indefinitely until you’ve finished the entire beer. The beer looks jet black in the glass, but it is more of a clear deep brown color when held up to the light. The aroma is fairly muted with touches of tootsie roll and milk chocolate. Flavor-wise, this is similar to Guinness in that you get a very light body that betrays your lips since you are drinking a “dark beer.” The lactose addition that makes this a milk stout usually manifests itself in extra body (extra sugar), but this one is just barely sweet. Similarly, the roast character is mild and bitterness is restrained at only 25 IBUs. Compared to the canned version, this one’s mouthfeel feels dull, but it could be from my feeble attempt at pouring this correctly. The recipe does include oats, but the mouthfeel doesn’t have a silky feel to it. Overall, this is about as mild as I can imagine for a stout. That may be a good thing, though, especially for those averse to powerful roast flavors. On to the canned version. This one is clearly marked with a best by date of 03/12/2018. Though the can size is 16 oz, the label reads 13.65 oz. That may be because some of the space inside is not beer liquid but is taken up with the nitrogen gas. Crack open the can and you get a really unique woosh sound that reminds you this is not normal beer. With a regular pour into the nonic pint glass, the canned version provides you with that perfect nitro stout pour with reverse cascade of brown foam in the center of the glass. At the top, a two-finger tall layer of micro-bubbled cream foam persists indefinitely until all the beer is gone. The aroma on the canned version is more assertive with sweeter notes like raisinettes, vanilla, burnt sugar, caramel, and more tootsie roll expected in this style. For the mouthfeel, the canned version is a big improvement. It is creamier and faux silky thanks to the nitro bubbles on the tongue. This version tastes sweeter too with that expected lactose quality that was missing in the bottled version. But the roast character and bitterness in this one are absent. Since the flavors and the aroma focus on the Munich and Crystal malt additions rather than roasted barley, I would think this was a German Dunkel or similar if sampling blind. The body is simple and clean, so I would say some sort of amber lager over any ale. Once both beers warm up to room temperature, the differences between them mostly subside. Both versions are good in their own right with my preference to the canned version for the better mouthfeel and visual aesthetics. And even though I typically shy away from milk stouts, these are less sweet than I expected. But then the roastiness and bitterness you expect in a stout just isn’t there in a meaningful way. That makes the beer a tad boring for the enthusiast, but I can see why this appeals to the larger American beer audience. Gas concentrations affect flavor (as you did a soft pour and not releasing them), releasing gases also affect aroma. That’s why you pour a beer into a glass, aroma affects flavor, flat beer vs carbonated beer tastes different, despite being the same liquid. Just as you proved in your experiment. It’s the same liquid, just treated with gas differently. The beer is identical, user error made it different. No different than saying this bottle of bells that is 2 weeks old tastes different than the can that’s 4 months old, but how was I supposed to know that age will make the beer taste different. How would someone know these special beer instructions beforehand after all. Bottom line, You are supposed to be a beer authority. You reviewed the exact same liquid and said they taste different and have different characteristics, through only your own user error and failure. If you want to write an article about how it’s confusing that you have to pour it hard, that has its own merit, but you are misleading people into thinking that it’s a different flavor and aroma, which if you did it right, is the same. I did not pour the bottled version flat. Age very well may be the difference here, as the canned version was fresher. I would love to have a bottle and can from the same bottling date, but that wasn’t an option for me when I purchased these. So they are definitely not the “exact same liquid”. They are also not treated with gas differently as far as I know. Your science also does not hold up. The harder your pour, the more gas will leave the solution. Shake the beer up and let all the dissolved gasses leave, and you will get flat beer faster. That intense force to pour is merely for the cascade effect and doesn’t affect the aroma or flavor. You are literally talking about 5 ounces of the bottle not being poured forcefully enough as reason to discredit this entire review and attack me personally on now four different occassions in public and privately. You screwed up that you are supposed to pour hard. Then complain it didn’t cascade. You are a genuinely dumb person. When you saw you screwed up, why didn’t you get another bottle and not be a dummy? Thank you, Phil, for the constructive criticism. The canned version is more user-friendly, obviously, since it doesn’t require any special pouring skills. If I messed it up, then anyone else buying this beer is bound to mess this up their first time as well. If you have friends over for a party and one beer out of all the others has special pouring requirements, how do you expect anyone to know that beforehand? The instructions are on the bottle cap, granted, but I don’t think your typical beer drinker and even enthusiast is looking for special instructions on the bottle cap. Usually, the bottle cap is just blank or a logo and is ignored. The canned version fixes that problem. I admit that I messed up. I think that is enough to say in my review. 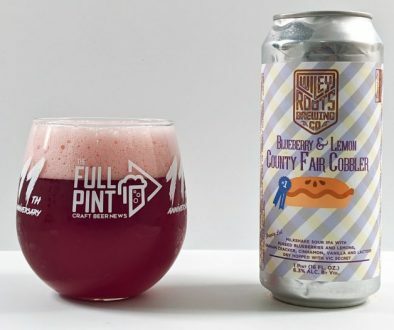 In addition, whether or not a beer “reverse cascades” is not going to affect the aroma and taste, which is the primary meat of a beer review. In this case, you can see from the photo that end result is that the beers look identical. The only difference is that one did not do a visual effect. That’s a very small part of this review and did not affect my overall impression.